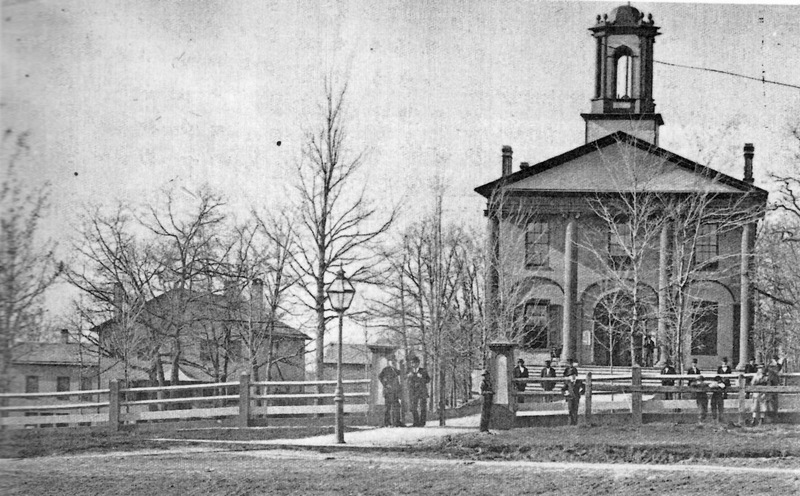 Livingston County Courthouse, Geneseo, NY -- This building stood between 1823 and 1897, when it was replaced by the current structure. The courthouse, some twenty miles from his home in Springwater, was where Sheffield Peabody attended numerous court cases as a witness, a member of the jury, or simply as a spectator. 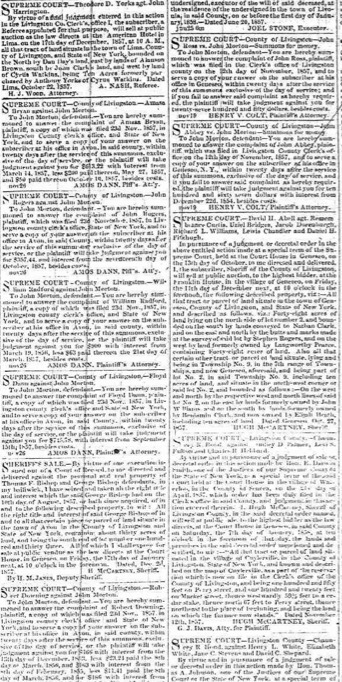 Livingston Republican, December 1857--This excerpt shows the results of local court cases published in the Livingston Republican during Sheffield Peabody's time. These excerpts were common in issues of the paper, and demonstrate the public's interest in the outcomes of local court cases. One activity that Sheffield Peabody was particularly invested in during the winter months was attending court cases. While there was still much to be done on the farm during the winter months, there is indeed a trend that shows Sheffield was more invested in the happenings of court cases during the winter. For example, on December 22 of 1849, Sheffield writes in his dairy “There was a lawsuit here. Commenced yesterday about 4 o’clock. The parties were from West Hill. It was about selling a clock for school tax. Mr. Phrasure as here from Dansville as a lawyer.” Even when Sheffield is not citing his own experiences at the courts, he cites the experiences of others, such as on March 5 of 1850, when he writes in his diary “Father and Wm. Thayer went out to Geneseo on Mr. Ford’s case. They adjourned it. It does not seem that Sheffield’s interest in court cases was unique to him, though. Looking back at issues from The Livingston Republican from this decade in the 19th century, we see a significant amount of page space devoted to the local court hearings that had occurred. It seems fair to infer that during this time period, there was an invested local interest in the outcome of these court cases. This focus on local court proceedings is markedly different than in the current day, yet there are still similar sections devoted in local newspapers, such as “police blotter” sections.